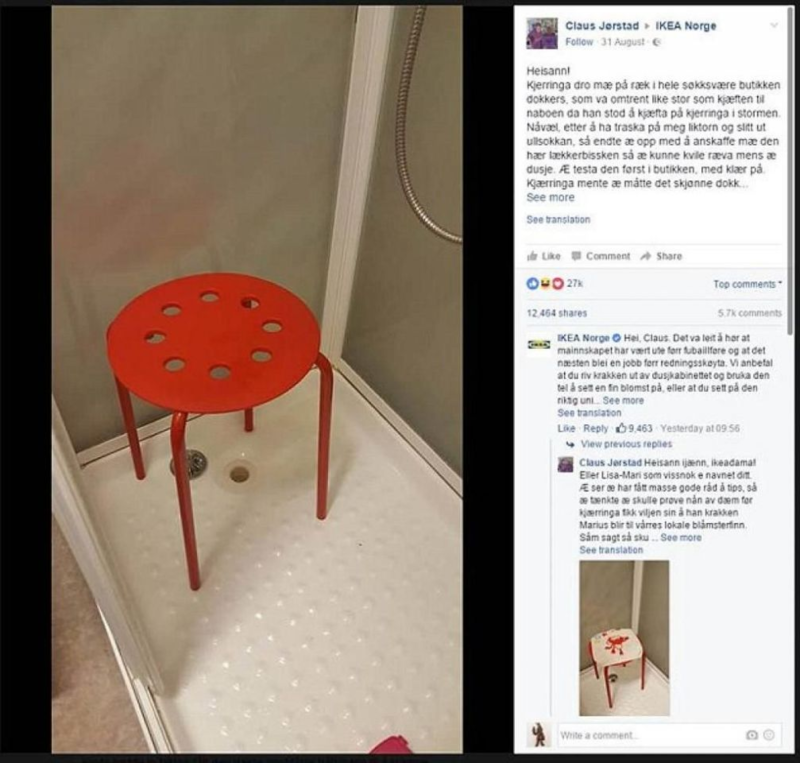 After a knee injury, Claus Jørstad of Alta, Norway invested in a MARIUS Stool from IKEAto sit on while he showered - but that plan backfired big time. While sitting on the chair during a recent rinse, one of Jørstad's testicles got stuck in a hole on the seat when the hot water caused them to expand. "Sitting there and noticing the accident, I bent down to see what happened, I realized the little nutter has got stuck," he told Daily Mail. He sat there so long, in fact, that the water turned cold. However, Jørstad thinks the freezing water was actually his saving grace. You see, the temperature drop caused his testicle to shrink again, which allowed him to safely free his little guy. Whew. But after the incident, he decided to warn others about his experience by taking to Facebook and alerting IKEA in a post that has since gone viral. IKEA's response? "Hey Claus. We recommend that you take the stool out of the shower... or that you sit on it with the right uniform on and in the right setting," a staffer posted on Facebook. "If you choose to keep it in the shower, make sure you are well dressed for your next sea excursion." Fair enough. So Jørstad did what he should have done from the beginning: He covered the stool with a wash cloth. Problem, solved. That's better than I thought when I read the title. I was thinking one of those IKEA wooden stick things folded up on his nutskies. Looking at the tiny pic of the cloth covered stool it looks like the problem was solved via castration. Must say he seems rather good natured about it. Good thing there was no snapping turtles around. Here's another example of why it's important to look after the family jewels!